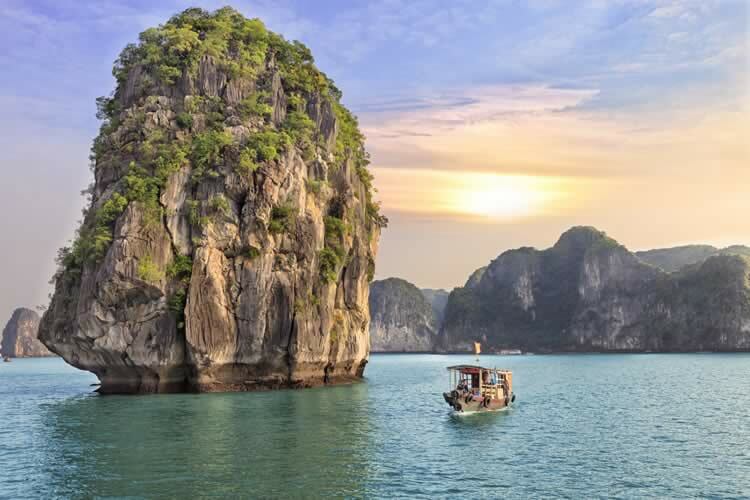 Explore the fascinating culture and flavours of Vietnam and Cambodia by land and sea with a 7 night cruise along the Mekong River and World-Heritage listed Ha Long Bay. Book selected July 2018 to April 2019 departures in a Category A Deluxe Balcony or above before 30 June 2018 and you will receive a complimentary upgrade to Business Class with Vietnam airlines! Make your way to London Heathrow for your flight to Vietnam. Be met and transferred to your hotel before this evening’s Welcome Dinner. Select from a range of sightseeing activities today in Hanoi. This evening, dine at your choice of delicious restaurants. Take in Hanoi’s city sights during a morning cycle ride. 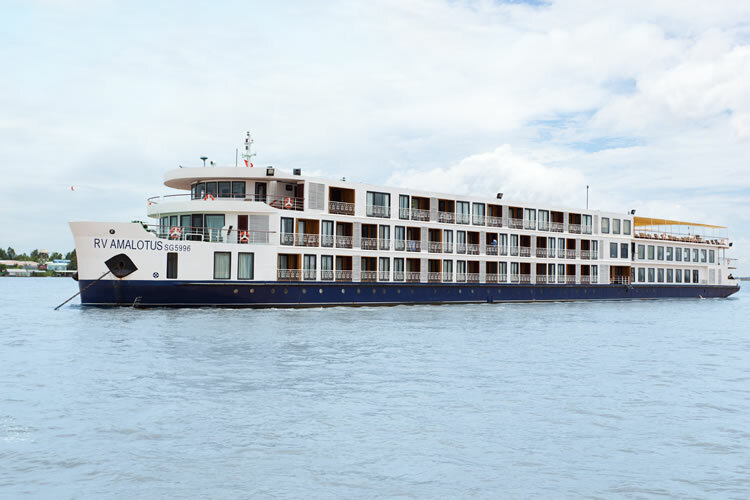 SIGNATURE EXPERIENCE: Travel to Ha Long and board a luxurious ship for your three-day cruise on World Heritage-listed Ha Long Bay. Enjoy lunch as you set off cruising through stunning scenery on Ha Long Bay. Later, drop anchor at Ban Chan Beach where you can go for a swim or participate in water activities. Perhaps enjoy Tai Chi on the sun deck during a leisurely morning on the water. After lunch, sail towards Bai Tu Long Bay for an afternoon spent swimming or kayaking, then visit Thien Canh Son Cave. Take a kayak or bamboo boat out to explore Vung Vieng fishing village before your ship returns to shore. Disembark and travel to Hanoi for your included flight to Siem Reap. Choose from an extensive range of activities that showcase the cultural heart of Siem Reap. Head to Angkor Archaeological Park to visit the last and most enduring capital of the Khmer Empire, Angkor Thom, and the 12th-century temple of Bayon. This evening, enjoy dinner and a traditional Apsara dance performance. SIGNATURE EXPERIENCE: Rise early and travel back to Angkor Archaeological Park for a glass of champagne as you enjoy a special sunrise experience at Angkor Wat. Tonight you can select from a number of local restaurants for dinner. Explore the vine-engulfed temple of Ta Prohm, a World Heritage-listed site, and pay a visit to ‘Opportunities of Development thru Art’. Transfer to Prek K’dam to embark your river ship. Tonight, celebrate the beginning of your cruise with a Luke Nguyen Welcome Dinner. Hop aboard a small boat to explore the lush wetlands near Kampong Chhnang, watching for water birds and traditional fishing traps near the riverbank. Back on your ship, continue sailing to the village of Koh Chen for a walk to visit the fine silverware and copperware workshops. From Prek K’dam, take a coach to Oudong where you’ll call on a monastery for a Buddhist blessing experience with monks. In Kampong Tralach later, ride an ox cart through the countryside, passing rice fields and smiling locals on the way back to your ship. Later, arrive in Phnom Penh. FREEDOM OF CHOICE™: Sightseeing Today, perhaps enjoy a tour of the Royal Palace and Silver Pagoda, or take a moving excursion to the infamous Killing Fields. Your other options are a visit to the National Museum or a city tour in a tuk tuk. Relax while border crossing formalities are carried out before arriving in Tan Chau. Transfer to a small boat for a journey along the tiny tributaries that snake around Tan Chau. Glide past a floating fishing farm, then take a rickshaw tour. Later, observe rural Mekong life on an evergreen island. In the city of Sa Dec, enjoy a small boat ride past floating markets, then disembark to visit a Cao Dai temple. You’ll also enjoy a guided tour of Huynh Thuy Le’s old house and visit a rice paper manufacturer. SIGNATURE EXPERIENCE: In Ho Chi Minh City (Saigon), attend either a memorial service at Long Tan Cross or visit the Cu Chi Tunnels. Disembark at My Tho Port and select from two Signature Experiences. SIGNATURE EXPERIENCE: Tonight, enjoy a Luke Nguyen-inspired degustation dinner with matching wines at Xu Restaurant. Discover the city on your choice of activities: tour the city on foot, enjoy a motorbike tour, visit the Ky Long Art Villa, join a shopping tour, or take part in a cooking class at GRAIN by Luke Nguyen cooking studio. Transfer to the airport this morning. Terms and conditions apply. All offers are subject to availability and operators booking conditions. Prices are based on two passengers sharing the lead in grade stateroom unless otherwise stated. All discounts have been applied to fares displayed. ^Itinerary operates in reverse, please call to confirm. *Fly free offer includes free return Economy Class flights and taxes from London Heathrow and is applicable to selected July - August 2018 departures booked by 30th April 2018. Flight upgrades may be available, however surcharges will apply. Fly Free in Business Class is valid on new bookings made by 30 June 2018, unless sold out prior. Flights are limited in numbers, offer is strictly subject to availability at the time of booking and is not combinable with any other offer unless specified, and can be withdrawn at any time. Business Class flights are with Vietnam Airlines. †Home pick up service is valid when booking within a radius of 75 driven miles from the UK departure airport. No cash alternative will be given. For journeys over 75 miles there will be an additional charge per car per mile. This service is only available for UK mainland. We charge a one-off small £20 booking fee. That’s it - nothing more and no add ons when you pay the balance. E&OE. ABTA P6710.